Phoenyx is such his fathers son. The shaving this new. I had no idea when he decided he wanted to shave but it was just a mere week or two ago when I realized the water in the bathroom was on for a long time and went to check. 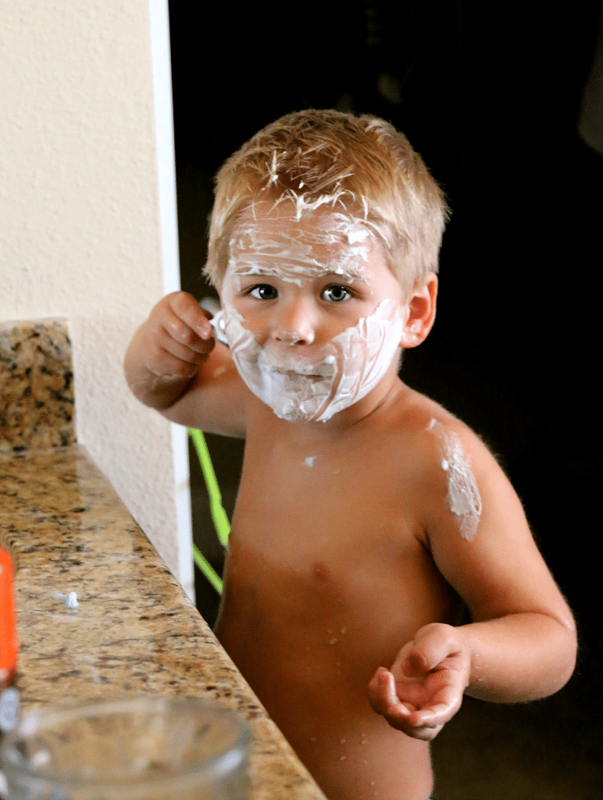 I found him standing on a stool, fully decked out in shaving cream and getting ready to shave. With a real razor. This might be OK for boys like 12 (heck I don’t even know what age boys shave) but for a 3 year old it could spell disaster. Now I don’t want to tell him it’s wrong. I want him to have good grooming habits so I had to think of a way to let him shave but not use a real razor. 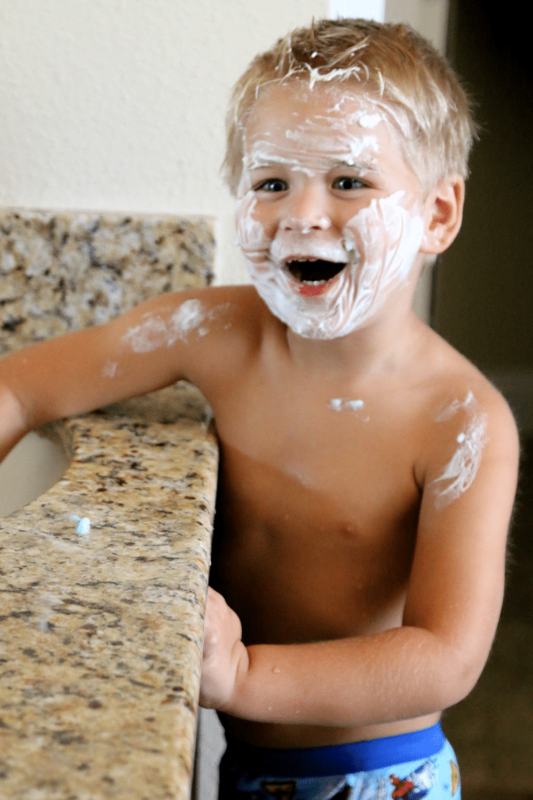 We had a discussion that daddy’s razor is just for a daddy’s face and I went on a hunt for something else that moment. Then I found something perfect. After opening the bathroom drawer and my eyes falling on a tooth flosser it was perfect. A good size, the same shape as a razor- total win! I gave him his “own” razor and its been history since. 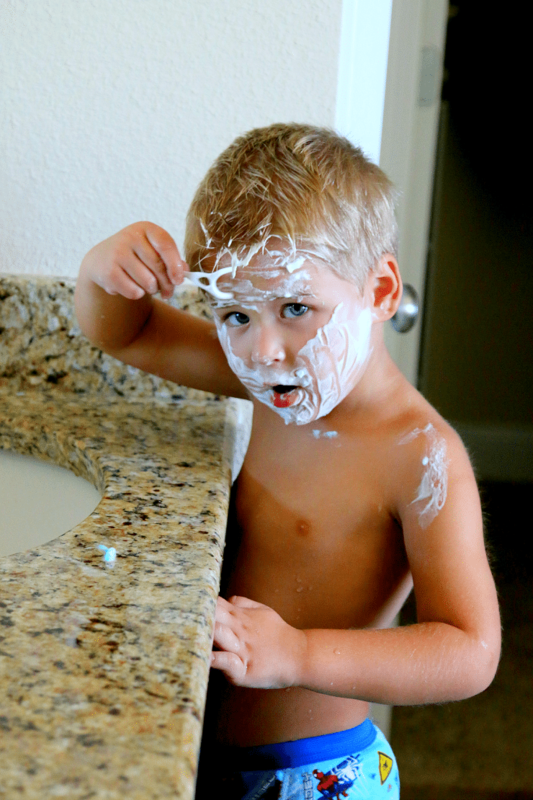 There was little P, chin to head in shaving cream, acting like a little man and I took a few shots before I was told to get out of the bathroom and give him some privacy. There ya have it- a mini flosser makes a perfect little boy “razor” – just dont mix that one up with your teeth. You will NEVER get that taste of your mouth. He is so adorable I don’t know how you can stand it Trisha! He’s gonna break hearts someday…. He’s so darn cute. Nice compromise mom!